I realize I have been posting a lot of recipes lately! No, The Life Of Faith isn't becoming a baking blog, but I do love sharing yummy recipes with you, and Fall is my favorite time to bake with all of the apples, pumpkins, and of course you can't forget about the zucchini that your mother-in-law keeps trying to get you to take home! My goal for my blog is for it to be a place that glorifies the Lord, not my own accomplishments. John 3:30 "He must become greater, I must become less." 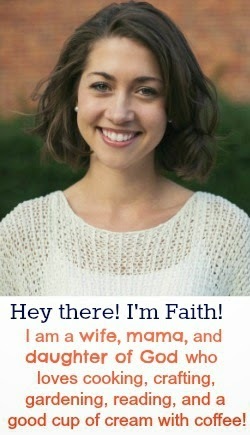 I do believe, however, that God is glorified when we as wives and mothers serve our family, friends, or even neighbors in the way of baking or cooking IF we are doing it in the name of the Lord! So you think you can't bless someone with that giant zucchini sitting on your counter? 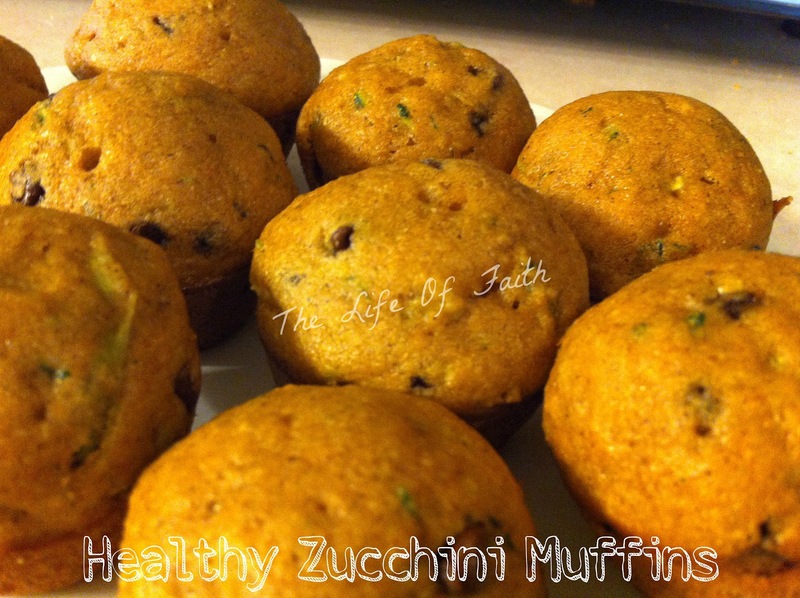 Let's try some healthy zucchini muffins! Now, I know I don't normally go the healthy route...the more carbs the better it tastes, right? Well this week I had a gestational diabetes scare and it really go me thinking about the way that I eat (and bake). Especially while I am pregnant, I need to be more health conscious! So for this recipe, I have used whole grain flour, and substituted apple sauce for the oil. Apple sauce instead of oil?? 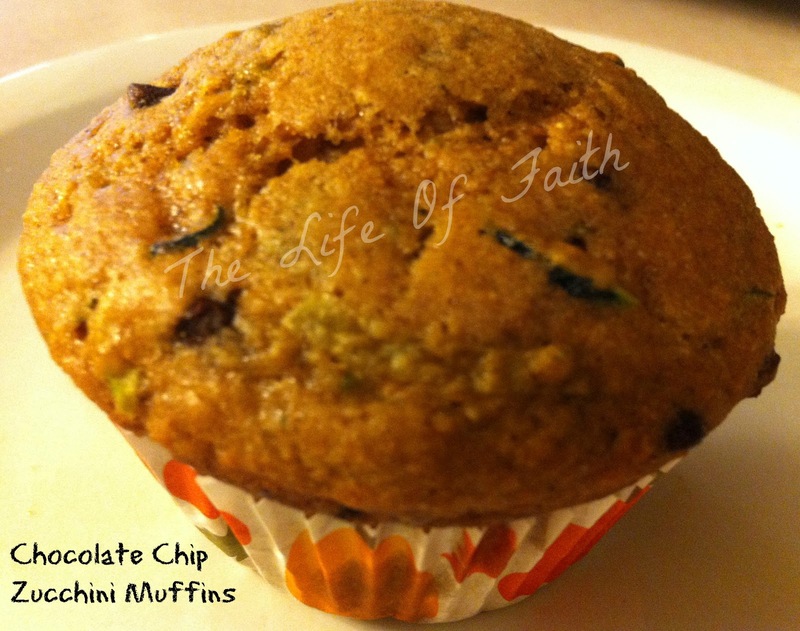 If your family is hesitant to eat any sort of muffin with a vegetable, add the chocolate chips...they disguise the zucchini well! Add the wet ingredients to the dry ingredients in the large bowl and mix together. Enjoy your healthy scrumptulicious muffins! Those look so great! I have used applesauce when making quick breads for a few years now as a substitute and I think it works great. Trust me, I'm no baker so that was a big leap for me to try that out! haha! Thanks for sharing the recipe. On another note, sorry to hear about the gestational diabetes scare! I hope you are baby are well! those muffins look great. Thanks for sharing. stopping by from the Sunday Social. These look good! I have been seeing a ton of recipes for muffins that have zucchini in them! I will admit I'm a little scared! Can you taste it?! I love your thoughts on serving others. It is so true and something to live by! It is so easy to share your light by taking the time to create and make for others. Thanks for the reminder to do everything with God as the focus. Visiting for the first time today. this looks delicious and not so difficult to make... i'm not a good cook - i actually wonder how i've become marriage material at some point in my life - but sometimes things like this make me want to try new things in the kitchen. thanks for sharing! found you through 'two in diapers'. i'm your newest followest :) hope you can find the time to come visit (and maybe follow) me too sometime. have a great weekend! These look delicious! Thanks for linking up at the CHQ Blog Hop! See you again on Tuesday!